Although we live far away from our family, when we do see each other, it is so very special. Sometimes it's only for 24 hours, and we make the most of every single minute we have together. Sometimes we make a big effort to get out and explore together. Walks on Wellington's waterfront or pottering around local play parks. And when we go visiting, walks up and down Nana & Poppa's road to spot the local wildlife. Pilgrimages to the Gardens to glory in the colour and wonder of the changing seasons. Other times we shut the world out and just 'be' together. Often there's no words necessary, it's just the enjoyment of knowing that we're in the same place at the same time. We're so lucky to have been able to adopt other members into our family, like Baba and Aunty Jackie who live locally and we can see more often. They are just as much part of our family now, and we love it. As well as regular fish n chip nites (Baba) or sleepovers (Aunty Jackie), they've both been super duper babysitters for us on many occasions! This year we've already been blessed to have an extended visit from Grandma who was with us for the month of March. Now we are on the countdown to the arrival of our wonderful brother and sister-in-law from Wales in six weeks' time. James has been to NZ before (only for about 10 days so he could attend our wedding in 2004), but it will be Ann-Marie and 7-year old cousin Jack's first time visiting The Land of the Long White Cloud. The last time we were all in the same time zone together was 2 years ago in the UK. 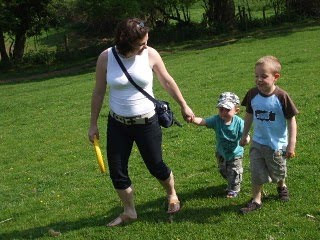 Jack had just turned 5, Noah was a wee toddler of 18 months, and Mylo was still a mere sparkle in our eye. And so the build up and excitement begins. We are longing to see you, our precious family. We are counting the days.